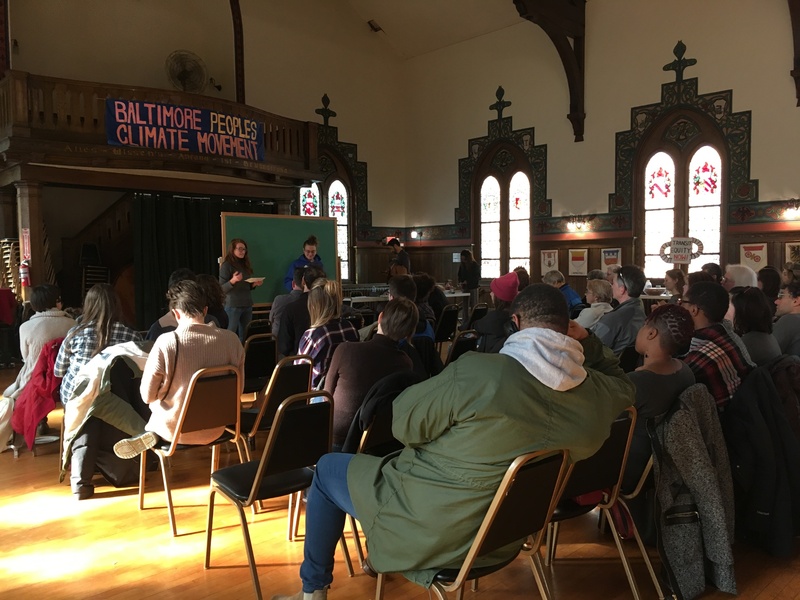 This past Saturday I had the opportunity to attend a teach-in hosted by the People’s Climate Movement, called “Scary Headlines & Climate Science.” Despite the foreboding title, I found the event to be very informative and overall quite positive. In those two hours, I learned a great deal about what has led to the climate situation we currently find ourselves in. The crowd was a pleasant multigenerational and multiracial mix of community members, organizers, scientists, and students. One attendee worth naming was Aletheia McCaskill, a long-time advocate for working families who sought election to the Maryland State Senate to represent District 44 (which spans west Baltimore city and parts of the county). We all came with widely varying backgrounds and levels of understanding of climate change, but it could not be denied that everyone in attendance learned something new. This was made evident in the many “oohs” and “ahhs” that rang through the audience. What really stood out what the thoughtfulness that went into the selection of presenters. Not just in terms of content but also experience climate justice work. Both presenters, Hugh and Senowa, had years of direct experience with the topics they were speaking on, and delivered with clarity. The first presenter, Hugh, began with a compact and digestible explanation of the chemical processes that have brought the global temperature to 1.5ºC, complete with hand-drawn chalk art for us visual learners. He gave a report back on the Intergovernmental Panel on Climate Change’s special report “Global Warming of 1.5”, providing historical context for the present climate situation and demonstrating how these changes have taken place over time. While his presentation primarily focused on the physical and biological processes at work, he skillfully tied that into the social impact that such processes have, including school closures and loss of jobs. The second presenter, Senowa, took time to decouple environmentalism from environmental justice; two different concepts and terms that have sometimes been used interchangeably. One point that really stood out was when she said that environmentalism is often thinly veiled consumerism. That is, we are often told that to care about the environment means to purchase a product that we perceive to be less harmful than some other product we would have bought, whether that is toilet paper or a car. Environmental justice, on the other hand, requires a shift in thought and behavior. It asks us to look deeper into what is presented as a problem or a solution. It needs us to question who is most impacted by pollution, desertification, and other climate-related issues. It forces us to realize that though people in working-class neighborhoods have the least access to “green” products and services, we are the most likely to have asthma, live near polluting factories, and lack access to healthy food. Personally, I found the teach-in to be a great way to initiate the 2019 series of PCM events that will continue to inform folks of the impacts of climate change in our city. I was inspired by the speakers to do some research into some of the environmental effects that climate change has on a global level. I was especially curious about how levels of drought and fire increase as global climates increase. Areas that were on the brink point of desertification have begun to tip over so that the few drought-resistant crops that were growing dry up and the land area becomes unusable for agriculture. One such example is in Sudan where 51% of the land areas between latitudes 10° and 18° are prone to desertification and have experienced it in some form since first analyzed in 1977. To further contextualize the Sudan example, several human rights groups identify this loss of once fertile land as one of the contributors to the Darfur conflict which resulted in massive loss of human life and displacement. Since gaining independence from the Republic of Sudan in July 2011, the government of South Sudan has made land remediation a top priority. This includes such actions as planting trees that thrive in arid climates and establishing seed banks to preserve such gems for future generations. I use this example to show how we can take bad news and use it as inspiration to a) not repeat the same mistakes and b) develop tactics for dealing with environmental devastation, regardless of their cause. These remedies may take years to implement and even longer to come to fruition, but we must shift out of the mindset of instant gratification. That thought pattern has contributed to the climate crisis, and it will not get us out of it. That being said, the teach-in inspired me to commit to beginning each day of this week with a short mantra to retrain my mind to focus on the positive aspects of the complicated environmental situation in. In regards to climate change, there is lots of negativity surrounding our discussions and actions. While the woes are justified, it is important to stay hopeful if we are to push this work forward. This is a long term issue. We did not get to this point after ten, twenty, or even fifty years. And it will undoubtedly take longer than that for us to see a shift toward a healthier, recuperated earth. Thus, my mantra for this week is: I treat my body as I do the earth, feeding it so it may thrive in this moment and all moments to come. I hope you will feel inspired to say this mantra as you rise, or create your own as we work toward a just world.